A recently-released CD of music by Philip Sawyers, which has been garnering much praise, includes another work written in memory of John McCabe. The work, for trumpet and strings, played by Simon Desbruslais (tpt), with the English String Orchestra conducted by Kenneth Woods, also includes stunning performances of Sawyers' Violin Concerto, Concerto for Trumpet, Strings and Timpani, and The Valley of Vision, inspired by the magical landscapes of the 19th-century painter, Samuel Palmer. The soloist for the Violin Concerto is the sweet-toned, eloquent Alexander Sitkovetsky. Simon Desbruslais has a record of performing McCabe works, having recorded his Trumpet Concerto, Primavera, with the Orchestra of the Swan, also under Kenneth Woods. Simon and Clare Hammond also premiered one of the last of McCabe's works, the Sonata after William Byrd's Haec Dies, written when he was already very ill. John McCabe was Composer-in-Association with the ESO from 2013 until his death in 2015, following which Philip Sawyers was appointed 'John McCabe Composer-in-Association'. 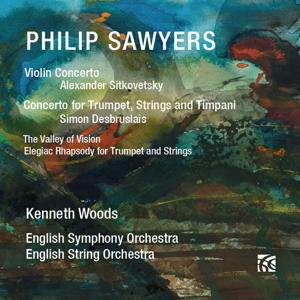 The new Sawyers CD, with the two concertos, the Elegiac Rhapsody and The Valley of Vision is released on Nimbus NI 6374.